Developed by Strong Dental, The SUAD™ family of premium oral sleep appliances is used in the effective treatment of sleep-disordered breathing. The SUAD™ appliances are clinically proven, safe, and FDA cleared for Snoring and Obstructive Sleep Apnea (OSA). The appliances function by comfortably positioning the patient's lower jaw forward, clearing the obstructed airway and allowing relaxation of the tissues at the back of your throat to ensure the base of your tongue does not collapse and block your airway, giving you a safe and soundless sleep. It is important to note that each and every single appliance is custom designed per patient. The SUAD™ family of appliances are non-restrictive in movement, allowing the patient to fully open and close his or her mouth, drink water, talk, yawn, and take oral medication. 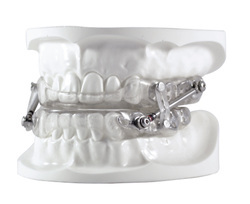 Our patented cased metal substructure greatly reduces the risk of tooth movement. 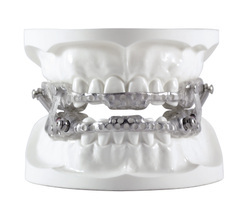 This metal substructure is also specifically engineered to withstand the forces of bruxism (when the patient grinds his or her teeth). All of our premium appliances are easily adjustable for optimal positioning. This tried-and-true oral appliance is where it all started for Patrick Strong. The unique and reputable casted metal framework design embedded within each device is what initially put The SUAD™ on the map. 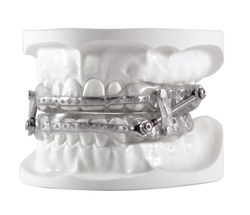 The substructure is specifically engineered to minimize tooth movement and appliance breakage. The Standard SUAD™ Device is also cleared for Medicare. This appliance is similar to The Standard SUAD™ Device but it incorporates a little more metal into its framework. Patrick developed this appliance to deliver the ultimate strength; he needed something that would stand up to clenching and bruxism (grinding teeth). The SUAD™ Elite is also cleared for Medicare. By combining the design characteristics of the SUAD™ Elite with the benefits of the Morning Repositioner we developed this breakthrough appliance. With this design, our patients are able to feel the back of their natural teeth meaning the tongue can move forward which opens up the airway even more, allowing for a more natural state of sleep. Initial reports completed by Dr. Mayoor Patel concluded that the SUE has a 14.6% increase in airflow volume when compared to the Standard SUAD™ Device. New digital technology has made it possible for our dental laboratory to design a revolutionary, cutting-edge and the most technically advanced oral sleep appliance to date. The SUE 2G is the smallest, strongest, lightest, and most effective two-piece adjustable appliance in our premium line. The SUE 2G has minimal acrylic and is ideal for patients seeking the most unrestrictive tongue space and exceptional freedom of movement. The SUAD™ B-H is a truly one-of-a-kind device that outshines all other standard Herbst appliances on the market. The SUAD™ B-H incorporates our patented casted metal substructure that reinforces strength in the appliance and ensures that pivots will not break out of the material. 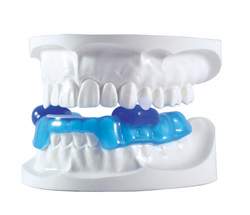 The SUAD™ B-H is Medicare approved and also has DentiTrac capabilities. 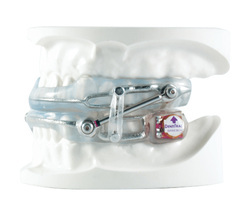 A hands-free bite deprogrammer that was designed to help return the patient's lower jaw back to the normal position. Patients are only required to use the Morning Repositioner for ten minutes after waking up. 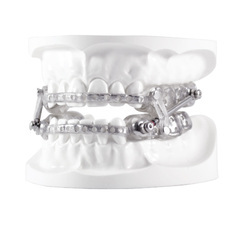 We include a Morning Repositioner with every SUAD™ appliance manufactured at no additional charge.